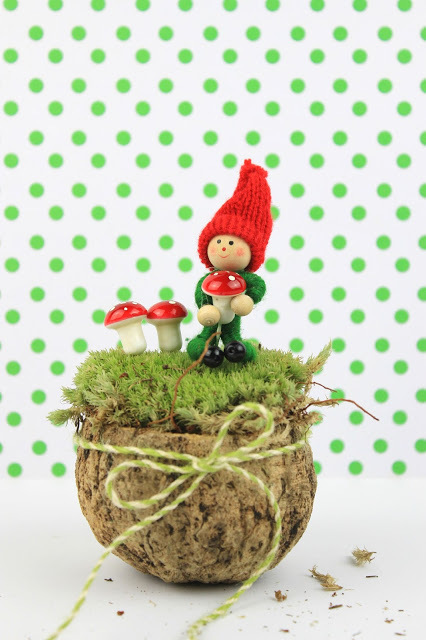 Diy Elf with Mushrooms Woodland Decor! 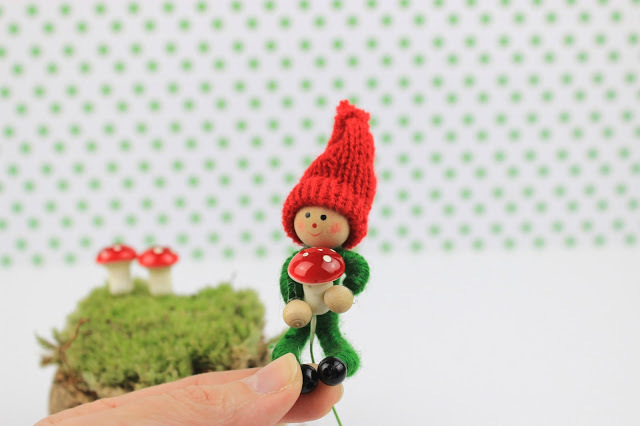 Add some tiny cute elves in your Christmas and home decoration and live the fairytale! No, it is not only because it is Christmas… I am in love with these tiny cute elfs, that I have decided to keep them in our home decor and after Christmas! Yes, I know.. I am a woodland and elfland freak! But I like it! The excursion we had in Parnassos mountain was enough to make me love even more everything about the forest. I might be a grown up woman, but my child inside me is still really active! And yes, I really would like to meet little gnomes and the smurfs… they do exist, you know! Our fireplace is full of woodland decor and our lucky charms and the gifts to our friends for this year, will also be insired by Nature! So, I found the cutest Elf and I kept it! Elf with Mushrooms! This is the easiest craft I have ever did. On the other hand is one of my favorite crafts and I am in love with it, so I have decided to prepare more! 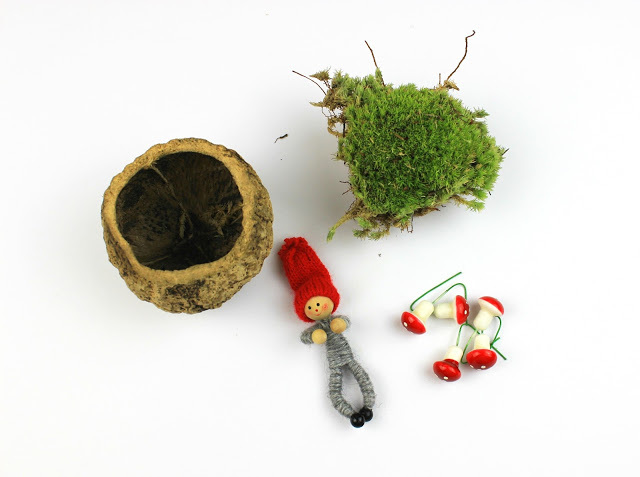 Lately my passion with moss is huge, that’s why I have already used it in our Christmas Ornaments, in our Advent Calendar, in our Lucky Charms for 2018 and now in our gifts! 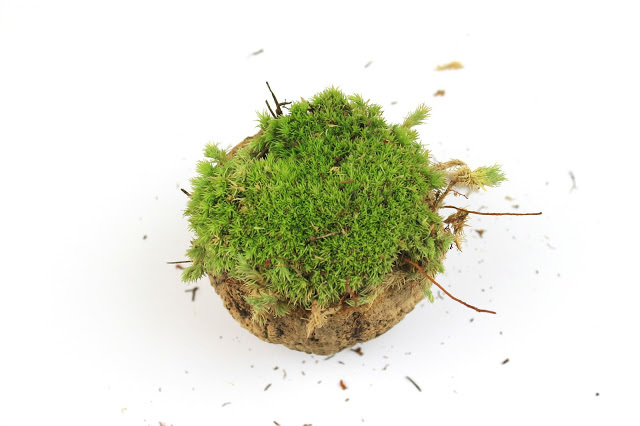 So, imagine my surprise when I discovered the Ball Moss!!! Simple amazing! And after that, I figured that I need something with ball schema to put it inside…the Ourico was just perfect! And what is Ourico??? The capsule from the Brazilian Nuts fruit! But what was sitting on it? A cute gnome holding mushrooms! 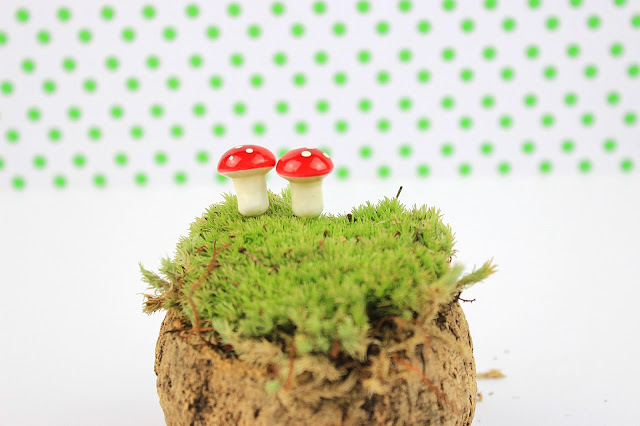 The little wooden mushrooms I found in Tiger stores, were simply perfect because they were having a small wire and they were easy to insert it in the moss. So no need for hot glue at all! 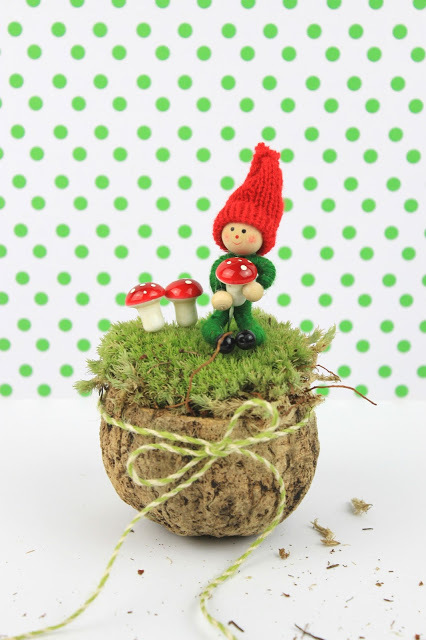 The elf can be also decorate our little elfland world without a glue. 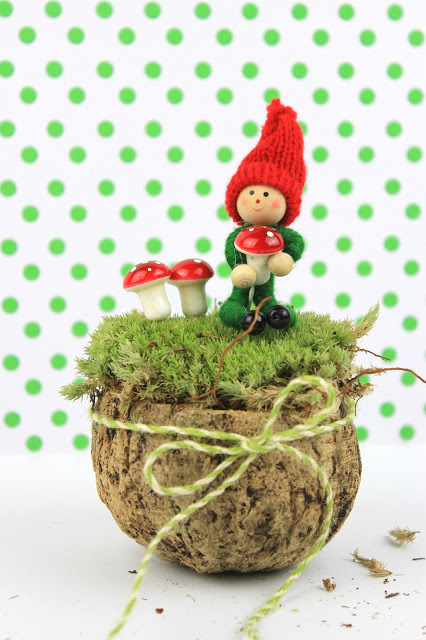 Just press his hands in order to hold the mushroom and insert the mushroom again in the moss. In this way the gnome also is going to be stable. Ribbon around the Ourico and our little Elfland World is ready! 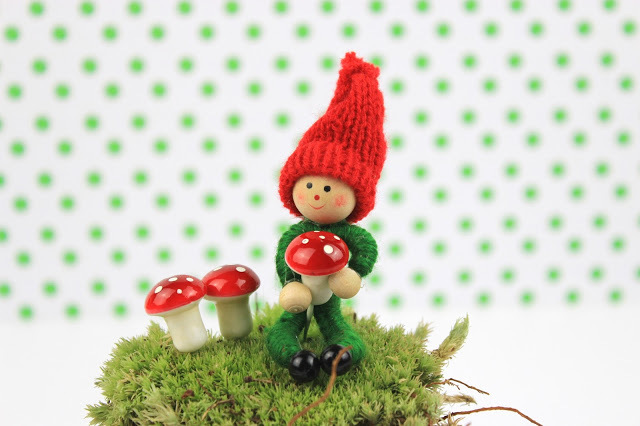 Elf with Mushrooms on the grass! Also have in mind that moss does not need any treatment at all! It actually lives with the humidity in the environment and really rarely you can add water with a spray bottle…. not much of course! In that way stays alive and green and lovely all the time! So, what do you think? Isn’t it so cute???? Our little Elf is already decorating our fireplace with the rest of the elfs and it will stay there possible until Summer…or maybe more… what about next Christmas??? hmmm… why not! Ναι ναι! Εννοείται ότι πρέπει να μείνει εκεί μέχρι τα επόμενα Χριστούγεννα! Είναι πανέμορφο! Πανέμορφο! Αυτές οι κατασκευές με τα βρύα και τα ξωτικάκια τελικά είναι τέλειες! Δίνουν ένα πολύ φυσικό στυλ σε όλα! Μπράβο! Μπαίνουν στα υλικά προς δοκιμή. ΚΑ ΤΑ ΠΛΗ ΚΤΙ ΚΟ!!! χαχαχαχα χαιρομαι που σου άρεσε! χιλια ευχαριστω! Δεν έχω λόγια…πανέμορφα! Κι εγώ αγαπώ τα ξωτικά, τις νεράιδες κι όλα τα πλάσματα του δάσους! ειμαι σιγουρη ότι από τώρα ετοιμάζεις τα επόμενα Χριστούγεννα! και με το στυλ σου θα το κάνεις άκρως μοναδικο!!! !